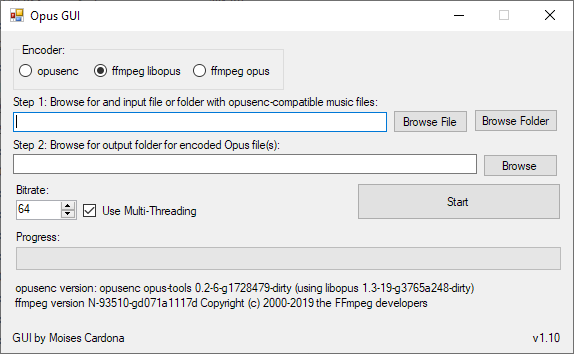 This new version adds support for ffmpeg’s native Opus encoder. I also included the latest x64 release of opusenc. As to what ffmpeg encoder to use, I recommend sticking to ffmpeg libopus, as my own tests revealed some artifact issues using ffmpeg opus. A difference between these 2 is that libopus encodes using variable bitrate while ffmpeg opus encodes only with a constant bitrate. Since libopus use variable bitrate, it can allocate more bits to those complex audio sections, hence having a better quality. You can download this new version at the project’s GitHub release page by clicking here.